On my '52 Raleigh, if I screw the nuts down to secure the wiring, the electricity stops flowing. If the nut to the right is loose, even if the other is tight, and I press the wires to the posts, it works fine. I have two theories. The most promising is that pressing the post down completes a loose connection inside the hub, and tightening the nut pulls the post away from where it needs to connect. My other theory is that maybe there should be a rubber washer at the base of the post and tightening the nut causes it to ground out on the hub body. Later models of the dynohubs have a strip of something between the two posts. It looks like a band of metal, but maybe it's an insulator of some kind. I know there's a clever way to solve the problem, but I haven't thought of it. Any ideas? Your photo puzzles me. Is this an AG? FG? GH6? And what's our attached to? That don't look like a '52 Raleigh. But to answer your question, I dunno! Your guess is good as mine. But I think you can disassemble the hub and test connections. The black Bakelite flange is somewhat fragile, so be careful. But unless you break that, everything else is reparable. It's in the truing stand. I just finished building the wheel. It's one of those $120 Craig's List finds that has spiraled wildly out of control. (I had a frame builder fill in the rounded spots on the rear dropouts for example). It is a '52 AG hub. I've had it apart and cleaned everything so it shifts beautifully now, but the Dynohub was the thing that pushed me over the edge into buying it. Are all the Dynohub internals the same? If I can't solve the current issue, (no pun intended), could I pop the internals from any other Dynohub, front or rear, in there? Or is the AG specific to the AG? And is it specific to a time period? I believe all the 6v SA dynamo parts interchange from one hub to another. The 8v and 12v dynamos were bigger, but that's not your problem. 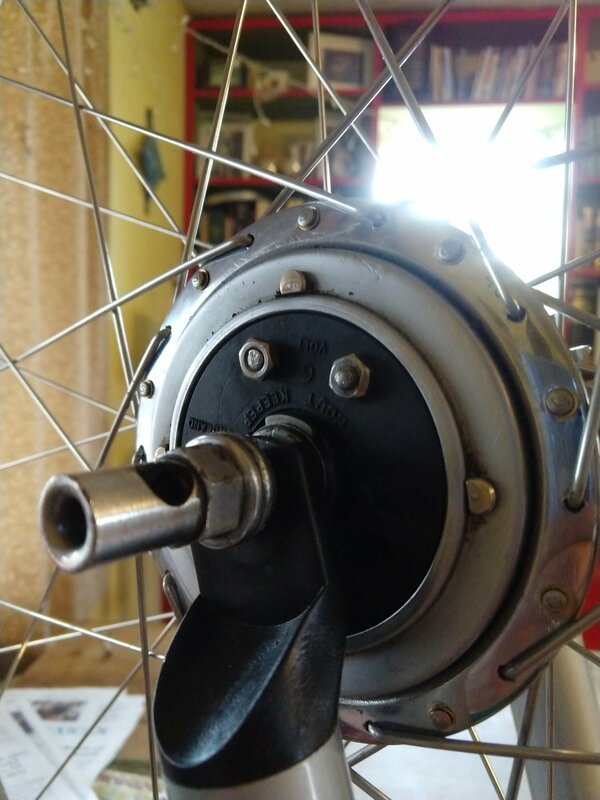 I just looked at a 1951 Dynohub and I don't see any way to disassemble the armature. It's easy to remove the magnet, and everything inside it, from the hub shell. That's the part that will interest you first. After that, it is easy to separate the magnet from the armature, if you want to do that (but all the instructions say don't do that without a keeper, which you probably don't have). It sounds like the problem with your hub is a loose connection between the armature and the terminals, and I don't know how to fix that. so yes, to answer your question, I believe you can seamlessly switch the dynamo parts (magnet and armature) from another 6v hub, front or rear. Thanks, I've had the magnet/armature assembly out when I rebuilt the hub, and I took a look at the photographs I had taken. It doesn't look like any hope there, and I imagine even if I had a keeper ring, taking the armature out wouldn't give me access to that connection. I've been trying all sorts of absurd things to get the terminal post wedged down where it connects, but I haven't had any luck. It looks like I'll have to keep an eye on Ebay for parts dynamos. It's frustrating that it sort of works, but not in a way that really works. Well, that's a bummer. Somewhere around 1952 they discontinued the Bakelite armature facing and after that it's chromed steel. The steel version isn't as cool, but it is more reliable. In all likelihood you will have to gett the steel version-- not just more reliable, but also much more plentiful.